While I was busy braising (read: sitting with my feet up) the shortribs, I decided to venture into two recipes that I have been intending to try. As my husband will tell you, I tend to be an impulse shopper. This spans from clothing to household items to food. In the case of food, it often tends to be a good thing. I love exploring farmers’ markets to see what’s fresh and relish in my weekly visits to the Reading Terminal where I inevitably come home with whatever Iovine’s has on sale that week. This past Saturday is was avocados, for example. How could I possibly pass up 10 for a dollar? Lately it’s been berries–again, fresh rasberries, blackberries and blueberries have been $1/container in weeks past. In fact, a few weeks ago, the berries were even organic! Hello bargain shoppers! How could I possibly pass up organic berries for a buck?!? Ironically enough, my husband and I aren’t the biggest berry eaters. After a couple days in the fridge, I tossed the berries in the freezer thinking I’d make a smoothie or a berry tart eventually. Fast forward to this week. I work at a school and have summers off. My crazy self decided that we could use the extra money and I decided to work summer school. I did not initially get placed and gave up on the idea of extra money and decided instead that I would pursue projects around the house. As soon as I made my list, I got the call. I spent the month of July counting the hours between 8am and 3pm and waiting for summer school to end. I finished a few days ago, but this has been my first full week of vacation. But I digress. Armed with a ton of berries and some kirby cucumbers that I got, yes, on sale, I decided to make pickles and mixed berry muffins. As my husband can tell you, I will often search for recipes and keep numerous websites open that has the “perfect” recipe for said muffins, lasagna, etc. I probably had the recipes for muffins and pickles up on my computer for at least a week. Let’s start with the pickles. Mark Bittman, who I trust completely, isn’t a fan of vinegar in pickles. 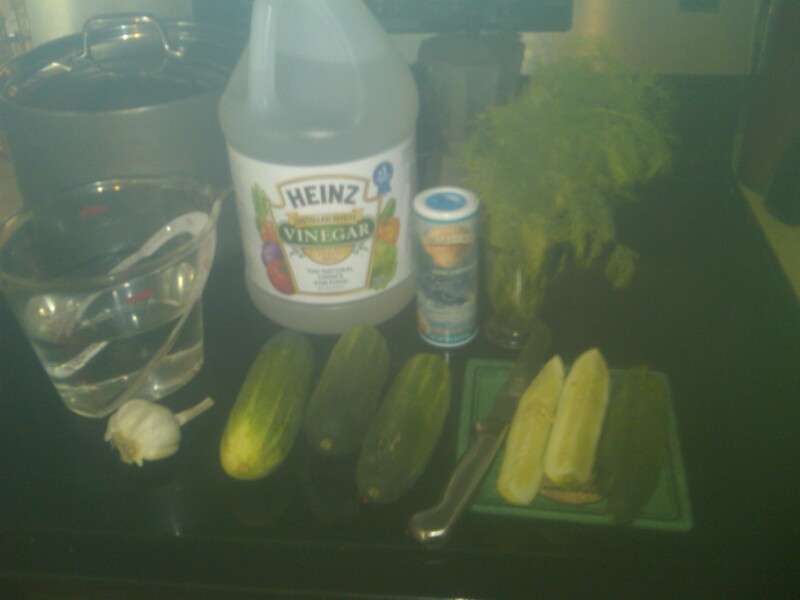 Although I was a pickle-making virgin, I felt it necessary to include at least some vinegar in my kosher dills. After searching high and low, I found this recipe on Annie’s Eats. The recipe had extra points because it had vinegar (and I obviously felt the need to use vinegar) and it didn’t involve boiling. I’ll take extra steps when necessary, but am just as happy to keep it simple. Here are my ingredients (or my mise) all ready to go! I used sea salt instead of kosher salt because, well, that’s what I grabbed. Combine all brine ingredients in a pitcher. Stir well to dissolve salt. 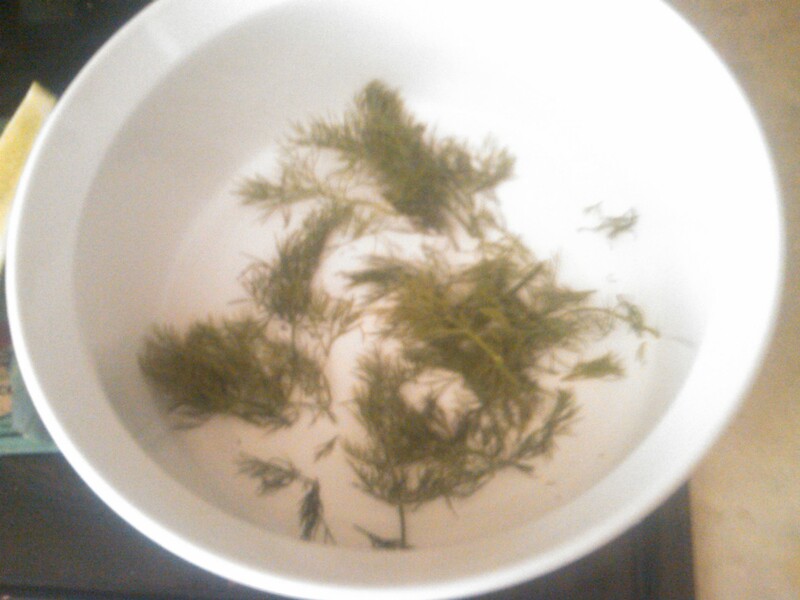 Put several sprigs of fresh dill in the bottom of each jar. Pack half full with cucumber spears. Layer with more sprigs of fresh dill. Finish filling the jar with cucumbers. Sprinkle some minced garlic on top. 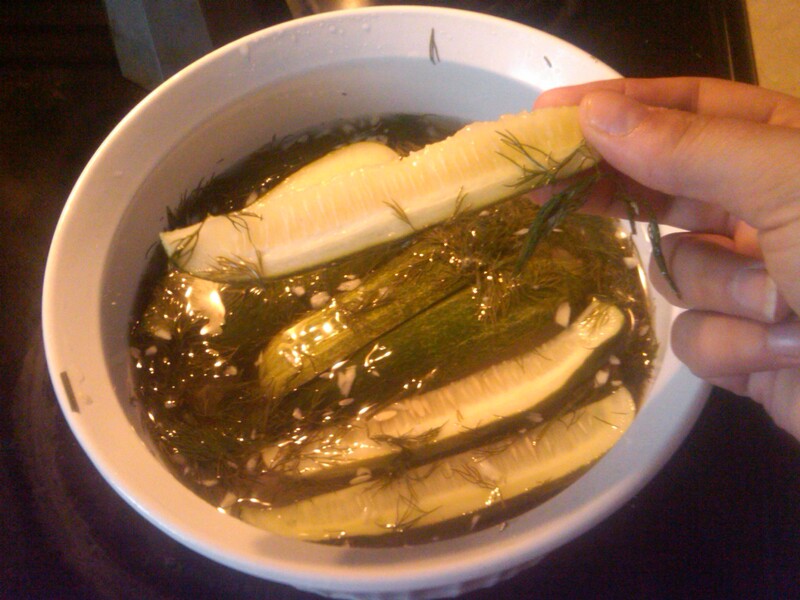 Pour brine into the jar until it is full and pickles are completely submerged. I needed to add a little more brine–which I totally eyeballed, of course. Put the lid on and allow to refrigerate at least 2 days before eating. Let me just say that dill is my new sleeper herb. I never thought dill was much of a star until I bought this bunch for the pickles. I have since used it in coleslaw, salad and just plain enjoyed the scent as it has sat on my window sill. After I prepared the pickles, I spent some time licking my hands. Even later in the day, I would occasionally stop what I was doing and smell the garlicky dillness on my hands and smile. Fast forward to last night. 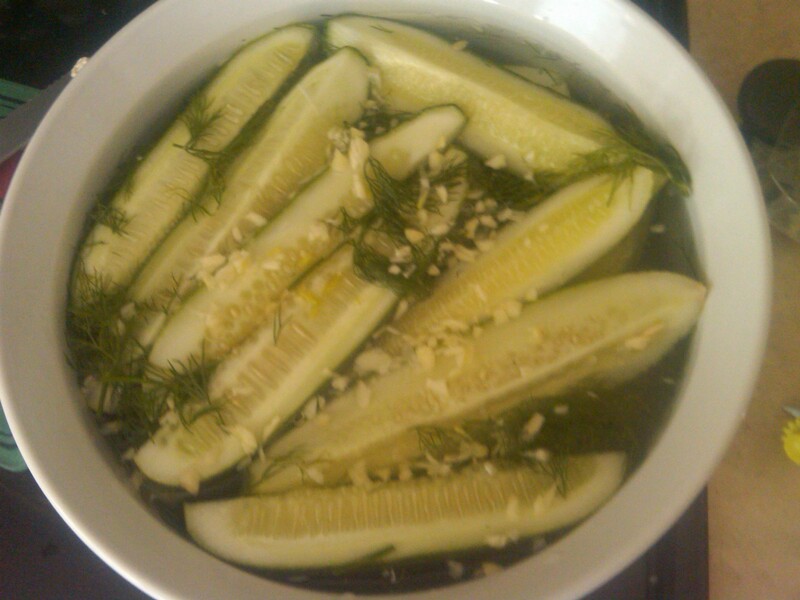 The pickles had marinated in their brine for two days and were all ready to roll. I put together a container for my friend as a mini birthday present (big deal for someone who loves salty things!) and came home and enjoyed a pickle as an appetizer before last night’s dinner. Verdict? According to my friend, Brian, the pickles were DILL-icious. Can’t get much better than that! 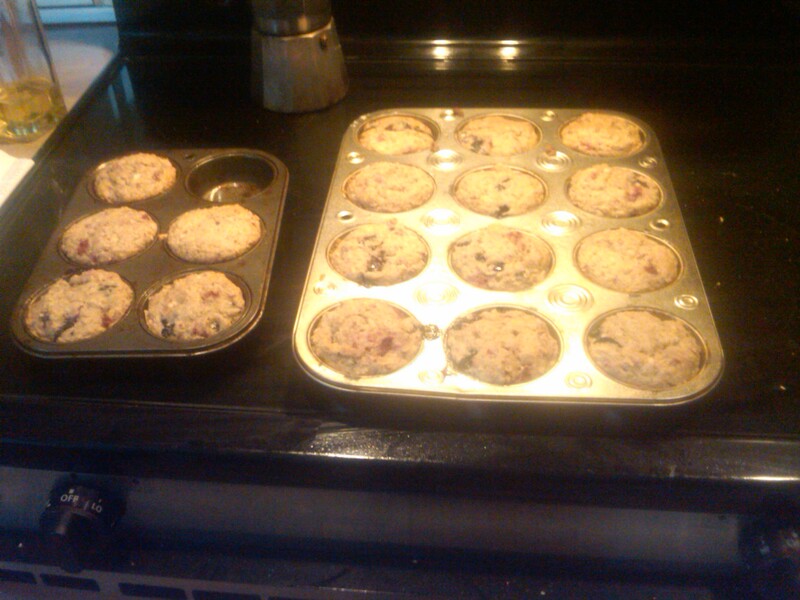 While the pickles were pickling away in the fridge and the shortribs were bubbling in the crockpot, I decided to get to business with these mixed berry muffins. I had bookmarked a few recipes but realized that I only have skim milk and I didn’t want to mess anything up. Let me also say that I’m not a huge baker. Neither my husband or I are big sweet eaters combined with the necessity of following directions when it comes to baking are not conducive to my lifestyle. After reading a number of recipes, I decided to use The New Best Recipe cookbook. I love this cookbook. It’s made by the Cook’s Illustrated folks and goes beyond providing basic recipes. It talks you through different style of cooking things and explains why the recipe that they are providing is the best option. For example, it talks you through the best way to make a roast chicken that’s moist on the inside, crispy on the outside. I use it for a lot of staples and basic recipes (burgers, meatloaf, chocolate chips cookies, etc.) to get a guideline or see how I could improve my technique for a certain recipe. 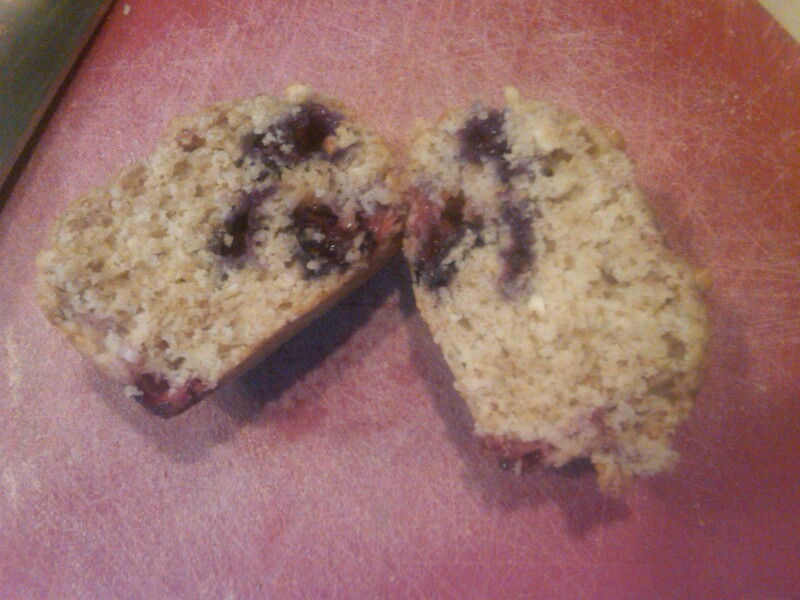 In the blueberry muffin entry, for example, it has the blueberry muffin “hall of shame” that includes mashed berries, sticky surface, flat top, etc. 1 1/2 cups (7.5-8 oz) frozen or fresh blueberries, preferably wild. 1. Adjust an oven rack to the middle position and heat the oven to 350 degrees. Grease a standard 12-cup muffin tin and set aside. I seemed to have extra batter so I grabbed my small muffin tin to make some extras. Umm, why is it that I always end up with odd numbers of baked goods? The muffins were quite tasty, although they probably made it into the blueberry muffin hall of shame for flat top, but I’m ok with that. They were still damn tasty! I am furiously preparing the above recipes: mixed berry short ribs, braised pickles and pickled muffins, if I ‘ve got them straight. Its crazy that you mention the Next Recipe Cookbook, as I was just eying it up in the store today, and maybe crazier still that i brined up some cucumbers yesterday too… weird. Anywho- if you are ever looking for a friend to gift pickles, you know where to find TWO!